So I am becoming somewhat of a hypocrite. When I started this blog I had a lot of idealism and firm rules in place on recipes. While I still believe in many of the ideas, I also have realized that some of my opinions have changed. The biggest change in my opinions is in regard to the use of recipes. I was pretty firm on my stance that I would never re-print a recipe from another site. While I still don't believe in re-printing recipes verbatim, I have softened my opinions on adaptations. That's part of the reason I took a couple of weeks off from blogging, I needed a break to decide what I wanted to do going forward on the blog. I have decided that I will begin to print recipes on my site with clear links to the original recipe and clearly adapted steps and directions. A lot has changed in the last three years since I started this blog and I have realized that I am constantly in a state of change myself. I hope that none of my readers will think badly of my decisions and continue to read my blog. Now that I got through with the heavy stuff, on to the recipe. My kids are both home for the summer and have been eating me thru house and home. We are all big sweet eaters in my household so I am always trying new recipes for cookies and baked goods. Chocolate has always been my personal weakness, I can't get enough of the stuff. 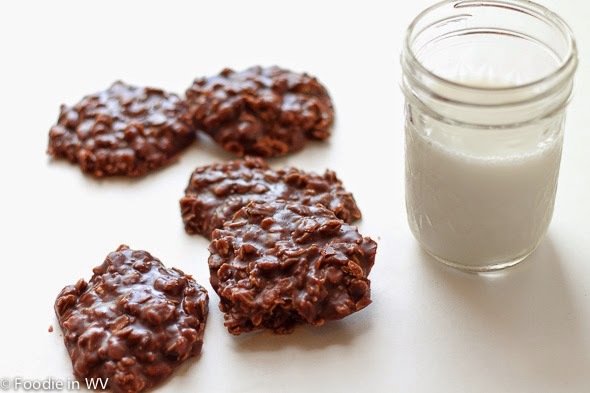 One of my favorite recipes is for No Bake Chocolate Oatmeal Cookies, they are so good! The recipe is as follows. Combine first 5 ingredients in a sauce pan. Bring to a boil and rapid boil for two minutes. In order for the cookies to completely set you must allow the cookies to boil for two minutes. If they aren't boiled long enough the cookies will stay soft. Take mixture off heat and quickly add oats, peanut butter, and vanilla. Drop cookies onto wax paper (I normally make my cookies about 1-2 tablespoons each, but the size is really up to you) and let cool. If your cookies don't completely set place the cookies in the refrigerator until firm. My kids really love this recipe. Every time I make them they only last a couple of hours. They also freeze well in-between sheets of wax paper and placed in a freezer bag. Since there is no flour in the cookies it's a nice gluten free option that doesn't use a gluten free all-purpose flour mix (just make sure your oats are gluten free). What delicious cookies and look tempting Ann! Thanks :) They are super easy to make and so yummy! of course we'll continue reading :) i actually like seeing the recipe because i can see right off the bat if it's doable (for my skill level!). i've always been curious of these no-bake pies and cookies. looks delish. 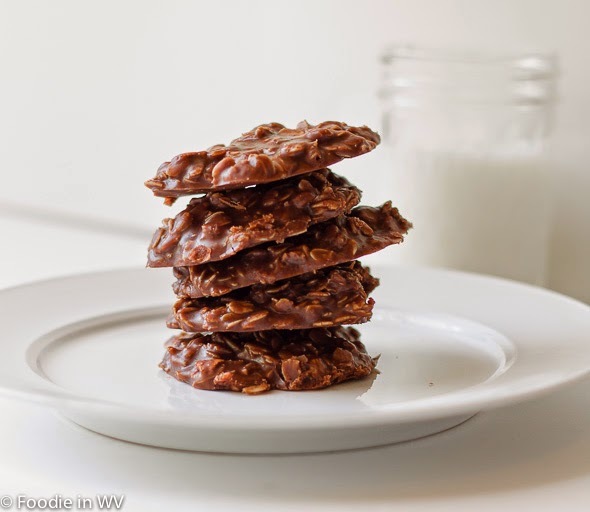 No bakes are the best! I love them in the summer when my kitchen gets hot during the day. They are a nice way to not heat up the kitchen. 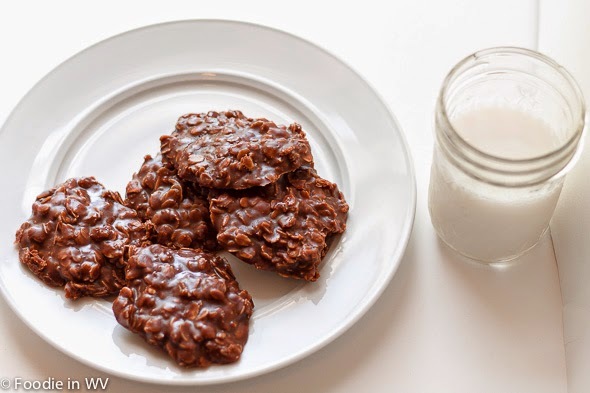 Can't believe those are nobake! They look awesome, Ann. Thanks, they are so easy! They are my kids favorite cookies! I agree. Blogs have to change over time! No bake sounds great! Cookies look great! I say...let the change happen! I love no bakes, it was 95 today with nasty humidity so I am trying to avoid my oven :) Thanks for the sweet comments!